What are the fine pairings of food and book? Is Kurt Vonnegut’s Player Piano a perfect complement to matzo balls? Are baked chicken legs best served with Catch-22? This is one of the delicious distractions to consider while paging through Michael Popek’s new book, Handwritten Recipes: A Bookseller’s Collection of Curious and Wonderful Recipes Forgotten Between the Pages (Perigree, $20). Apparently a closeted vegetarian was reading 365 Ways to Cook Hamburger (Doubleday, 1960) because she left a recipe for zucchini bread inside. Was a Betty Draper-type housewife reading Frank Edwards’ Strange People whilst she whipped up macaroni loaf and apricot bavarian cream? Sour cream coffee cake with Less Than Zero is an odd combination, but two different kinds of pickle in The Spy Who Loved Me (NAL reprint, 1963) seems understandable. Because some of the recipes are untested--let’s call them vernacular--Popek goes the extra step and brings in experts for some of the more interesting dishes. Blogger Shannon Weber of A Periodic Table, for example, provides professional measurements and advice for a pineapple chiffon cake recipe that seems thoroughly worth trying out. Many of these “found recipes” turned up in cookbooks, for obvious reasons. So for cookbook lovers, there’s the added bonus of finding interesting new titles. Slenderella Cook Book by Myra Waldo (Putnam’s, 1957) contained a recipe for Boston Prune Cake and Salads, Sandwiches and Chafing Dish Dainties by Janet M. Hill (Little, Brown, 1914) offered okra gumbo. Popek, who runs Popek’s Used and Rare Books in Oneonta, New York, seems to have a found a recipe for success in scrapbooking the paper ephemera he finds between the pages and among the stacks in his daily business. His first book, Forgotten Bookmarks (reviewed here last year), focused on letters, postcards, photographs, and other bookmarks he has uncovered. The handwritten recipes here were culled from the nearly 5,000 he has found in the past few years and are now published in color alongside the book (with a basic bibliographical entry) that each was in found in. For daring home cooks, food historians, lovers of paper and ephemera, this book is altogether satisfying. Bring one to your Thanksgiving host. What are the fine pairings of food and book? Is Kurt Vonnegut's Player Piano a perfect complement to matzo balls? Are baked chicken legs best served with Catch-22? 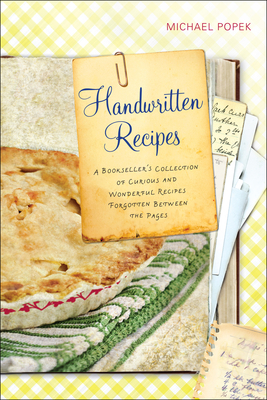 This is one of the delicious distractions to consider while paging through Michael Popek's new book, Handwritten Recipes: A Bookseller's Collection of Curious and Wonderful Recipes Forgotten Between the Pages (Perigree, $20). Apparently a closeted vegetarian was reading 365 Ways to Cook Hamburger (Doubleday, 1960) because she left a recipe for zucchini bread inside. Was a Betty Draper-type housewife reading Frank Edwards' Strange People whilst she whipped up macaroni loaf and apricot bavarian cream? Sour cream coffee cake with Less Than Zero is an odd combination, but two different kinds of pickle in The Spy Who Loved Me (NAL reprint, 1963) seems understandable. Because some of the recipes are untested--let's call them vernacular--Popek goes the extra step and brings in experts for some of the more interesting dishes. Blogger Shannon Weber of A Periodic Table, for example, provides professional measurements and advice for a pineapple chiffon cake recipe that seems thoroughly worth trying out. Many of these "found recipes" turned up in cookbooks, for obvious reasons. So for cookbook lovers, there's the added bonus of finding interesting new titles. Slenderella Cook Book by Myra Waldo (Putnam's, 1957) contained a recipe for Boston Prune Cake and Salads, Sandwiches and Chafing Dish Dainties by Janet M. Hill (Little, Brown, 1914) offered okra gumbo. Popek, who runs Popek's Used and Rare Books in Oneonta, New York, seems to have a found a recipe for success in scrapbooking the paper ephemera he finds between the pages and among the stacks in his daily business. His first book, Forgotten Bookmarks (reviewed here last year), focused on letters, postcards, photographs, and other bookmarks he has uncovered. The handwritten recipes here were culled from the nearly 5,000 he has found in the past few years and are now published in color alongside the book (with a basic bibliographical entry) that each was in found in. For daring home cooks, food historians, lovers of paper and ephemera, this book is altogether satisfying. Bring one to your Thanksgiving host.